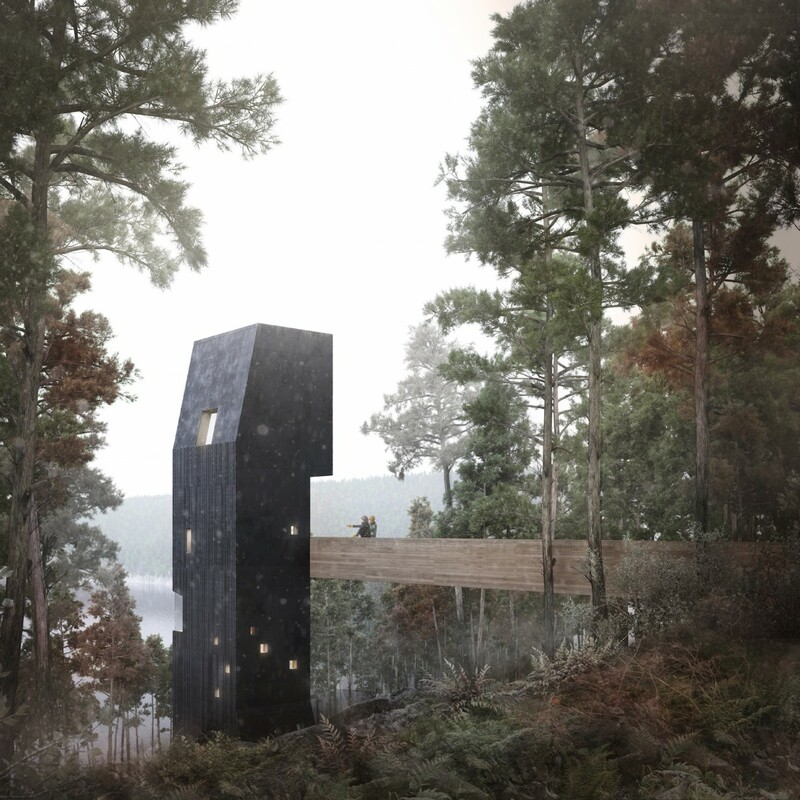 The National Trust for Scotland has commissioned Denizen Works to build a timber observation tower within Inverewe Garden, Wester Ross, to improve the visitor experience for those not suffering from vertigo. 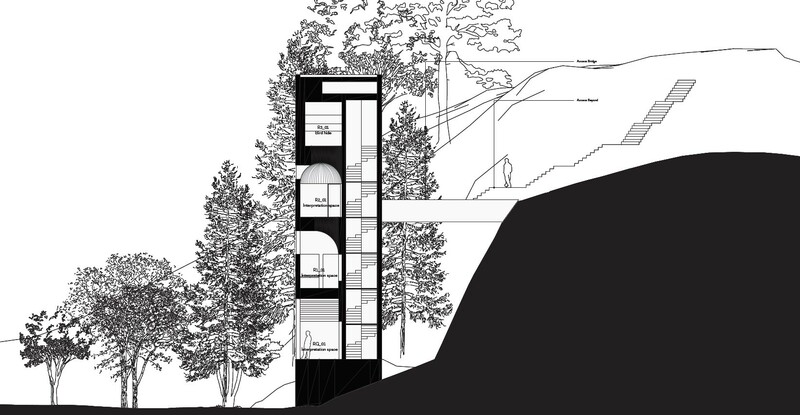 Combining a vertical gallery and bird hide the elevated space has been modelled on a woodpecker’s nest or a sliced tree trunk to signpost the outer reaches of the botanical gardens and connecting to existing footpaths by a dramatic bridge. Upon entering the tower visitors will climb up from a base gallery through different levels of commissioned artworks, each designed to impart a different ‘spatial experience’. 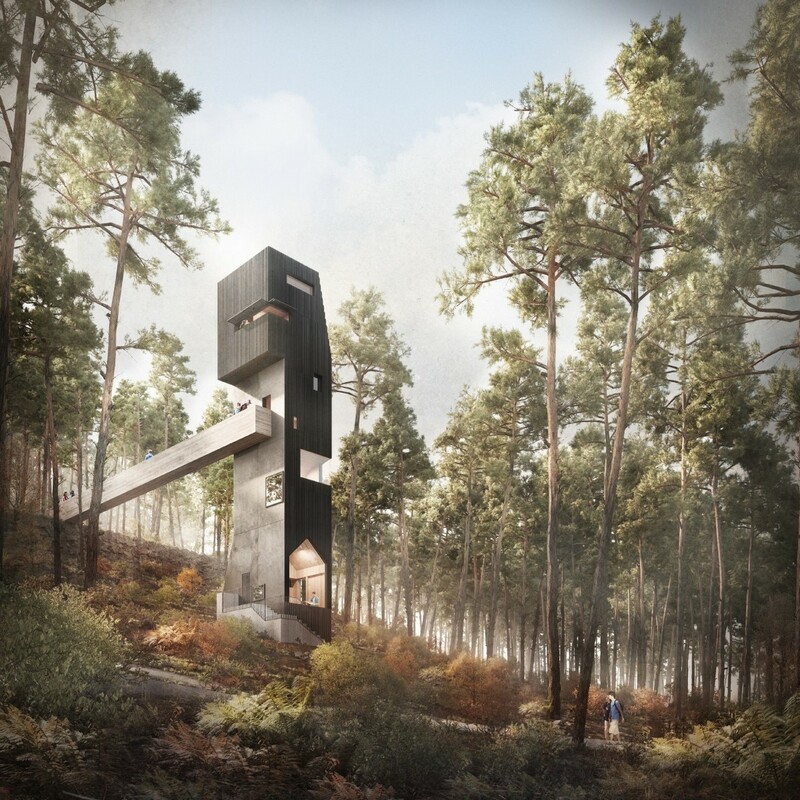 Those who make it all the way to the top will be rewarded with a lofty bird hide affording views out above the tree canopy. 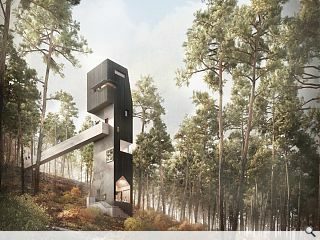 Framed in dark, stained vertical larch cladding and smooth pine tar above a base of hammered concrete the ‘totemic presence’ of the tower will signpost a wider rejuvenation of on-site retail and dining facilities in addition to a scattering of lower key sculptural interventions throughout. 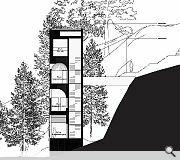 A planning application has already been presented to Highland Council in anticipation of a start on-site being made in the autumn, for completion by the following spring. This looks tremendous. Imaginative and exciting. Well done Denizen Works. The design looks interesting, if never deliverable - but do NTS just speak to their london friends when commissioning work? It sits lightly on the landscape but the building itself looks a bit top heavy to me... and has a kind of uncomfortable randomness. A pitched roof might be an improvement. 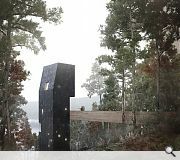 If its supposed to be a bird hide, I wonder if there are alternative exterior materials which would work better. There was a an interesting house at the Housing expo in Inverness which was clad in a black rubber material and metal webbing to allow ivy to grow up it. Nah mate. Looks like a killer robot from a Christopher Nolan movie. Surely sometimes its best to leave the ego at home and let the context do the talking? Also, why write "signpost a wider rejuvenation of on-site retail and dining facilities" when you mean "there will be a shop and a cafe"? #6 Haha, so true... that's total pretentious *&^&. Visitor attraction with no disabled access - really in 2018? @#8 - to be fair (going by site plan and my sketchy knowledge of the site having visited many years ago), the area where the viewpoint is located is on a steeply sided hill and the only way to get to it is via steps anyway. At some point you have to be realistic about what can actually be achieved given site constraints - there are many other examples of viewpoints in Scotland where it is simply not possible to have disabled access due to topology. I really like the look of this. Theres some real skill at work here and RE #6, its not too much for me at all. I think the landscape can take this in its stride. The only worry is the capacity to achieve it really, even by the architects. The visuals are excellent, but that section is an absolutely bogin' drawing, which does make you wonder.